Guinea Listeni/ˈɡɪni/, officially the Republic of Guinea (French: République de Guinée), is a country in West Africa. 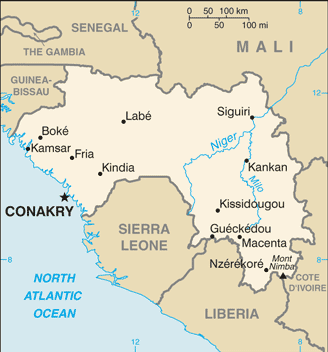 Formerly known as French Guinea (French: Guinée française), it is today sometimes called Guinea-Conakry to distinguish it from its neighbour Guinea-Bissau and the Republic of Equatorial Guinea. It has a population of 10,057,975 and an area of 246,000 square kilometres (94,981 sq mi). Forming a crescent as it curves from its western border on the Atlantic Ocean toward the east and the south, it shares its northern border with Guinea-Bissau, Senegal, and Mali, and its southern border with Sierra Leone, Liberia, and Côte d'Ivoire. The sources of the Niger River, Gambia River, and Senegal River are all found in the Guinea Highlands. Provides information about Guinea’s history and tourist information and also has parts of Ethnomethodologie et Conduite de Projets Informatiques by Omar Touré who maintains the website (in French). Connaissez-vous la République de Guinée?